Nathan Adams guided First Avenue to victory in the Imperial Cup at Sandown. The unfancied pairing finished strongest in the heavy going, and went past second-placed Tanerko Emery and long-time leader Kazlian on the run-in. Kazlian was among the front runners for the entire race and opened up a seven-length lead but his progress was halted when he almost fell at the second last. "I haven't ridden a winner for a year and this is the fourth of my career," said a clearly surprised Adams. "I had a lot of confidence in the horse and then coming up the hill he took off." Kazlian looked the likely winner three jumps from home but his lead was quickly wiped out after he clattered into the final fence and lost his momentum, despite the efforts of jockey Tom Scudamore. First Avenue was the only other horse who was staying and the eight-year-old galloped clear through the mud and past the winning post to win by three and a half lengths, while Kazlian was also overtaken by Tanerko Emery on the run-in. Trainer Laura Mongan added: "I'm still in a bit of shock. I was just hoping he was going to jump the last safe and sound. "You've got to have a bit of confidence but we'd have been over the moon if he'd been placed. To win is incredible. We'll cherish this one. This is my biggest win by some distance." 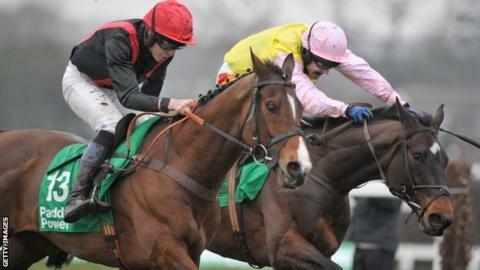 Favourite Mr Mole was pulled up by his jockey AP McCoy in the closing stages.